The beautiful serene island is a must visit for anyone who wants o find inner peace and if not possible just looking at the pictures you will find your inner peace. The beautiful sandy beaches, archeological sites, beautiful villages and volcano sites are just breathtaking. The image of the beautiful villages hanging on the cliff is all you need for a memorable holiday and inner peace. Let us explore the beautiful island that will make you find inner peace just looking at the stunning pictures. The caldera is located in Fira Santorini, one of the world natural wonder and the most breathtaking site in the world. The caldera is more than 3500 years old, and it occurred due to a volcanic explosion. The landscape of caldera consists of cliffs and steep rocks. It creates a perfect harbor because it has one thousand feet above and below the sea level. 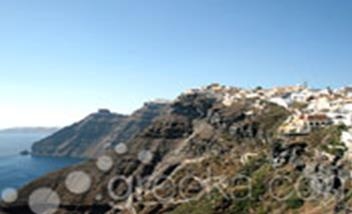 The caldera is surrounded by the beautiful cities like the Fira and Oia, which are tourist destinations. The cities give you unique and beautiful view of the caldera. The most famous village in Santorini is known as a quite village. 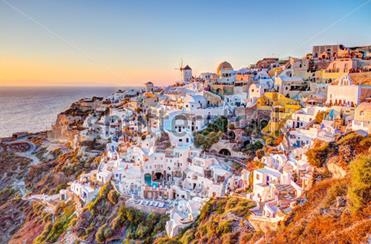 The sunset from the village is just breathtaking, the most photographed village in Santorini and the most beautiful. It is situated on a top of an impressive cliff, and it offers a very spectacular view of the volcano of NEA Kameni and Palia and also the island of Thirassia. It is a very traditional village with many charming houses in the narrow streets. It has blue domed churches and the sun-bathed verandas. The streets of Oia have many tourist shops, cafes taverns, other outlets. Oia is known to be much quieter than the Fira village. 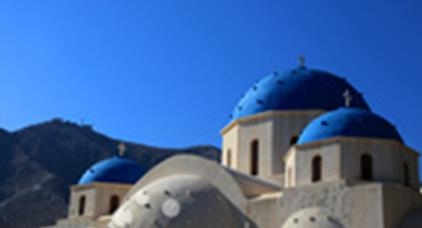 The village of the Oia is known to have many art galleries and tourist attractions like the Maritime Museum. The beach of Armenis is located at the Oia village. The Kamari beach is covered by the black sandy soil while on its left side of the Kamari beach is an enormous rock that is called Mesa Vouno and it rises from the sea. Kamari beach is located ten kilometers away from the Fira village. The Kamari beach area is extremely attractive and at night when the Mesa rock shines in the darkness. The Kamari beach is fully organized, and it offers a broad range of comfortable facilities like the sun beds, the umbrellas and it holds various types of water sport and fishing. The water sports that you can enjoy at the Kamari Beach include water surfing, skiing, diving and deep fishing. You can also take quite walk barefooted along the beautiful quite water line. The beautiful view of the sea is all you need to have a relaxing and find your inner peace. The water is so welcoming that you can spend the whole day just in the beach. The red beach is the most famous and the beautiful beaches of the Santorini. The red beach is located near the ancient site of the Akrotiri. The beach has red cliff that are just peaceful and breathtaking. You can choose just to admire the unique landscape of the red and the black volcanic rocks instead of going to the beach. The water is very inviting, and the sun bed will give you that comfort you deserve in the beach. You can participate in various water sports like surfing and water volleyball. Snorkeling is advisable and makes sure you take lots of pictures of the underwater creatures. You can collect the soft pebbles as your souvenir. The unique and natural beauty of Santorini is just breathtaking. The high cliffs offer fantastically colored sunset that will just leave you amazed. The healing hot spring is a must visit. The cruises can take around the volcano and have a peace of mind as you enjoy the natural beauty of the volcano. You can walk along the black lava of the steaming volcano; you can also discover the volcano's crater and others that are bursting with the sulfur steam. The views of the villages hanging from the cliff just by looking at the village pictures will give you that inner peace. The outside beauty of the church of the holy cross will just give you inner peace, looking at the picture of the church of the holy cross you just want to be part of the church. The church is located at the central square of the Perissa, and it is just above the beach. The Holy Cross church has a massive bell tower and the blue dome. The impressive size of the church is just what you need for quite time with your creator. 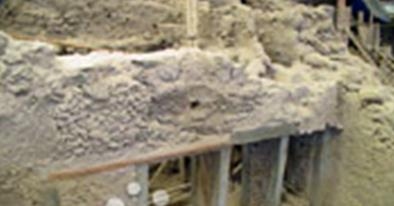 The archeological site of the Akrotiri is main attractions of the Santorini Island. The site is located in the village of the Akrotiri and the Red beach on the southern part of the island. The site is just awesome and gives you that sense of belonging. A donkey ride is what will give you that inner peace; the well-adorned donkey will make you appreciate creatures more. The donkey will take you around the villages and give you that beautiful, memorable adventure you have ever experienced. Pictures speak louder than words the beautiful photos of various tourists sites of the Santorini will just make you have an inner peace of mind. Server responsed at: 04/21/2019 10:18 p.m.